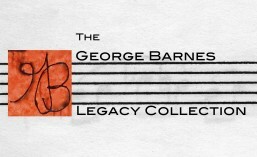 The George Barnes Legacy Collection | …aspects of the truth. 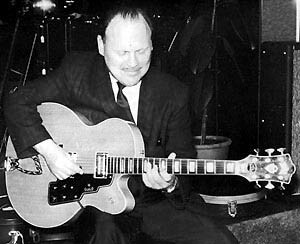 A brilliant, innovative, consummate musician whose influential career spanned 44 years, electric guitar pioneer and jazz guitar great George Barnes was one of the first electric guitarists in history — and the first to record commercially, at the age of 16, with such blues greats as Big Bill Broonzy and Blind John Davis. Before Charlie Christian, who adored and lauded him. Before Les Paul, who admired and envied him. Inspired by Bix Beiderbecke, Sidney Bechet and Lonnie Johnson. Inspiring countless guitarists, from Chet Atkins to George Benson to John Pizzarelli…you name ‘em, they listened to him, loved him, and learned from him. THE GEORGE BARNES LEGACY COLLECTION dynamically tracks the untold history of Barnes’ indelible influence on American popular music — from 30’s blues to 40’s swing to 50’s & 60’s rock and country, and jazz throughout , until his untimely death in 1977 — and brings Barnes to new generations of musicians and music lovers. At last, George Barnes fans, students and collectors can own previously unavailable material from his family’s private collection: recorded music (including repackaged releases of select albums and singles), compositions & arrangements, teaching methods, photographs, documents, and video & film footage, curated with care by his daughter Alexandra and his widow Evelyn. Generously supplemented with personal anecdotes, this is a rare and entertaining opportunity to study the life and work of a completely dedicated musical genius — through his family, friends, co-creators, students — and Barnes himself. What did country artists Chet Atkins, Eddy Arnold, The Jodimars, The Dinning Sisters, The Sweet Violet Boys, Jimmy Dean, Homer & Jethro, Patsy Cline, Buddy Holly, Louise Massey & The Westerners, Patsy Montana & The Prairie Ramblers, Bob Atcher, and Janis Martin have in common? They all loved working with legendary jazz guitarist George Barnes. Although Barnes’ jazz styles of choice were swing and the blues, he was a multi-threat musician, thoroughly unlimited in his ability to compose, arrange, play and produce any genre of music while remaining utterly identifiable. When he was hired as a staff musician and arranger for the NBC Orchestra in Chicago at the age of 17, his first assignment was National Barn Dance, playing with the country stars of the day. He’d always listened to music of every category, and was prepared to bring his talent to country music. Within a year, he was a featured artist on another national radio program, Plantation Party. Barnes was featured on the show every week and, through his regular appearances on national radio, Chet Atkins — and a host of other guitarists of all genres, including Roy Clark and Bucky Pizzarelli — became aware of, and inspired by, the young electric guitarist from Chicago. In 1957, George recorded COUNTRY JAZZ, his jazzy version of country-folk classics (and a few originals) that has become one of his most influential recordings. Young guitarists — particularly country and rockabilly players who hadn’t yet been born when George died in 1977 — are as enthralled by that recording as rock guitarists are of anything from Jimi Hendrix or Eric Clapton. GEORGE BARNES: COUNTRY JAZZMAN is a unique and collectible 8-panel, DVD-sized CD package, featuring choice airchecks from 18-year-old George on Plantation Party, and every track from COUNTRY JAZZ, straight from the Barnes Family archives. GEORGE BARNES: COUNTRY JAZZMAN will be released in August 2015. You can pre-order your copy of this historic CD now! In the spring of 1941, 19-year-old guitarist George Barnes had already been a national radio star for almost two years, and enjoyed jamming with his colleagues after they’d wrapped their respective NBC shows. 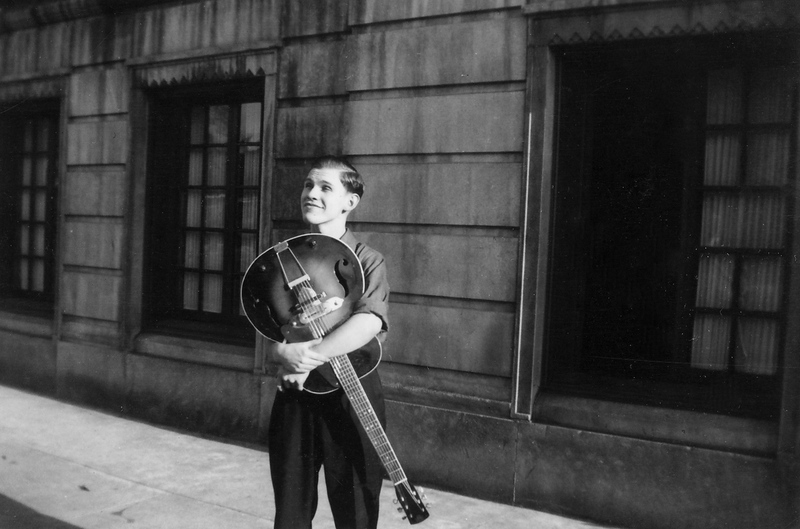 George’s friends would drop by his Chicago apartment in The Chelsea Hotel and play into the wee hours. These 15 tracks were recorded directly to acetate discs and, with each playing, acquired the inevitable patina of age. But you can still easily hear in these pre-WWII home recordings George’s early explorations of his musical options — including his extraordinary, even eccentric, piano inventions, clearly influenced by Fats Waller and Art Tatum, to whom he listened when he first laid his hands on the keys as a toddler. We’ve added two bonus tracks to this collection, from October 1941 — recordings by George and fellow electric guitarist Ernie Varner of two Barnes originals. G Minor Spin and Swoon of a Goon are historic commercial recordings that heralded a new age of guitar. These entertaining recordings provide fresh insight into Barnes’ early works, and are a must-have for any Barnes fan, student, or collector. For those guitar students who want to learn how he did it, GEORGE BARNES: THE METHODS, contains lessons that have not been commercially available for over 35 years, as well as content that has never before been released — including informal recordings of private lessons with Barnes and a selection of his master students.